Personalised badges next day are in great demand for all kinds of celebrations. They are synonymous with birthdays. many birthday cards have a badge attached to the front. this is just a generic 'age' badge. So if possible, wouldn't it be better to get one with a name on it as well. And maybe an additional personalised message. Well the answer is - it is. Of course we produce the traditional standard age badges but we also can personalise them with whatever message and in most cases with your choice of colour. If you have a photograph of the birthday boy or girl then please send this as well We can usually clean it up or extract the relevant part of the image to make a really impactive badge. 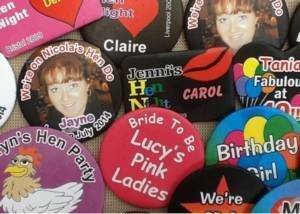 The other popular area for personalised badges is for hen nights and stag nights. We have a selection of images that you can choose, or use to base you own ideas upon. If you have a photograph - particularly if this is likely to cause amusement to the party then we can include this together with any message. Besides the popular round badges we have rectangle and heart shaped options. Added to the 3 different sizes of round badges gives you 5 different formats for your designs. So you should be able to find something that suits your particular party plans. For many orders for personalised badges next day delivery can be essential. We know from experience that all too often you forget to order the smaller items for the party. It might seem to be important to us ! - but maybe we have a distorted view of their importance. We print and produce the badges in house, so provided you order before our cut-off time, then we can usually despatch the order quickly. If you also choose the next day delivery postage option then you should be guaranteed your order in record time.